The Peru owns 60% of the varieties of cocoa in the world and is the second largest producer of organic cocoa. We offer many special varieties of cacao such: blanco “porcelana”, chuncho, pangoa, etc. Cacao Porcelana is a special variety of Cacao Criollo. Its cultivation is very difficult because the production per hectare is minimal and has a low resistance to diseases. Approximately from 1000 flowers, only 1 becomes a pod , within there are 25 to 30 cacao beans . It is called porcelain because it has the highest fat content among cocoa types and the grain is completely white. Moreover, its shape is different; their maracas green or yellow are almost smooth, unlike other types of cocoa that have grooves. It is said that this type of cacao has a little taste of almonds. It is the type of Cacao with less acidity. Porcelain cacao is found in the regions of Piura and Tumbes, which are located very close to the equator. This zone of the north coast of Peru is favored due to the humidity, wind and temperature characteristic of this tropical zone. The largest production is found in the valleys of Palo Alto, Morropón, Buenos Aires and San Juan de Bigote. Cacao Porcelana is considered as the most precious in both quality and price in the niches of international markets. Cusco Region. Tamed by the native community “Matsiguengas” this cacao is cultivated in the valleys of the Convention. The importance of this type of cocoa is not only economic but also social, since it has been cultivated for over 100 years, being an alternative instead of cultivating the Coca leaf. This Type of Cacao is known for its creaminess, aroma and characteristic flavor. The harvest times change depending on the variety of cacao and the ecological floor, Cacao Chuncho is harvested mostly from December to February. Other characteristics of this cocoa are that it shows tolerance to the main threatening diseases and has an outstanding quality in terms of aroma and low acidity in cocoa liquor. Pangoa, district located in the province of Satipo. 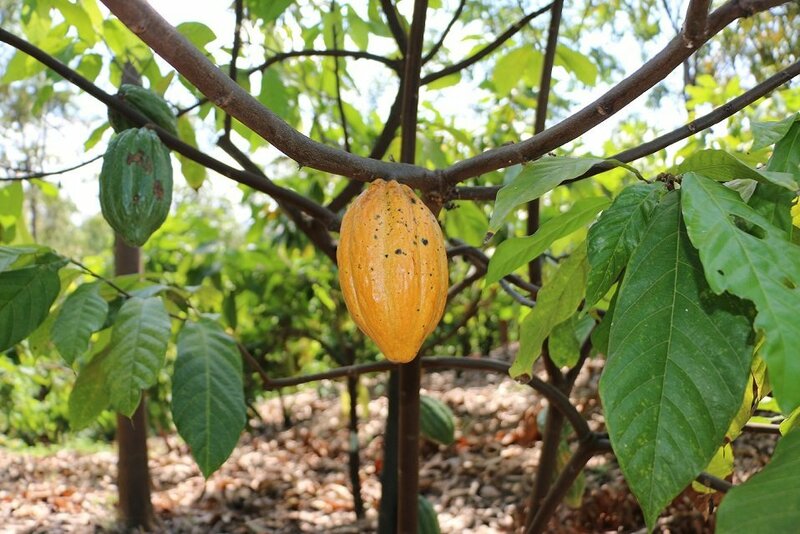 Pangoa is the main cocoa producer in the Junín region – It currently has a production of 8,000 hectares of cultivation, of which 75% is Native or Criollo Cacao. Cacao Criollo is distinguished because it has elongated fruits, which end in a thin point. Its shell is soft and the seeds round, white, sweet and of a very pleasant and characteristic flavor. It is possible to recognize the Criollo type when observing the cob/pod, it has ten furrows in pairs along. Five of those grooves are deeper with protruding loins: they are wrinkled and irregular. The reason it has a superior aroma and flavor is because the seeds are high in fat, the seeds are of better quality and are used exclusively to make the best chocolates and fine pastry in the world. The price of this Cacao is higher than the Trinitarian, Forastero and CCN-51, since the tree is weak against pests and also the production per hectare is smaller.